The Dallas Cowboys Loge describes the midfield sections on the bottom level of 400 level seating at Cowboys Stadium. 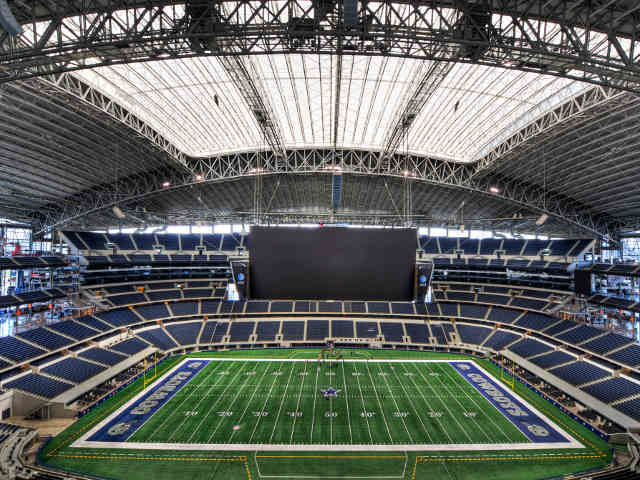 The Cowboys Stadium seating chart shows the Cowboys Loge in seven sections on each side of the field between the 10 yard lines. Dallas Cowboys Loge sections are numbered 409 through 415 on the Cowboys side of the field and 440 through 446 on the visitor’s side of the field. The Loge seating area is surrounded by Upper Reserved sections from both sides and above. There is a small walkway separating the upper 400 level with Upper Reserved areas from the lower 400 level with Loge areas. A much larger space divides the lower 400 level with the Loge seats from Dallas Cowboys Suites spread throughout the area between the 300 and 400 level. While some fans will enjoy the reduced size of each Loge section with correspondingly smaller crowds, the minor view difference between the Loge seats and the Upper Reserved seats makes it unwise to pay a significant premium for Loge tickets. Consult the Dallas Cowboys seating chart and detailed information about other Cowboys Stadium seating areas: Cowboys Club Hall of Fame, Cowboys Founders Club, Cowboys Suites, Cowboys Club Main, Cowboys Club Mezzanine, Cowboys Hall of Fame, Cowboys Main, Cowboys Mezzanine, Cowboys Loge, Cowboys Upper Reserved, and Cowboys Party Pass. Cowboys Loge tickets are sold as part of the franchise’s “Seat Option” program which serves as a personal seat license with attached rights. Buyers interested in acquiring Loge tickets from the team are required to buy the rights to a specific seat for $12,000. This purchase allows a buyer the right, but not the obligation, to buy season tickets for the specific seat for $1250 (subject to annual increases). If the buyer fails to purchase season tickets for a specific season, those seats are made available to other purchasers and the buyer receives no compensation. This seat licensing program, which is commonly used by most major sports franchises for premium seats, is an odd choice for poor quality 400 level Loge tickets at Cowboys Stadium. Avoid purchasing the $12,000 seat license from the team at all costs as Loge tickets for any game can be found on the secondary ticket market from ticket brokers and independent sellers. The market price of an individual game Loge ticket ranges from less than $40 for preseason games to in excess of $250 for popular regular season contests. However, given the excessive, up-front licensing fee of $12,000, it is always cheaper to find Loge tickets on the secondary market rather than purchase a multiple-decade license from the team. photo: cliffbaise by creative commons license.